"America is not without her problems in business, the home, in industry, in civic and in government life. We need a rededication of our people to the elementary virtues of honesty, unselfishness, and love; and we must have the will again to find what unites people rather than what divides them... The future depends not only on what a few men may decide to do in Europe, but upon what a million men decide to be in America." When Frank Buchman issued his called for a rededication to Christian values in May 1939, Europe was only months away from the explosive outbreak of the Second World War. That spring, however, Buchman was one of the nation's most popular and influential religious evangelists. His call for a "moral re-armament," which was also the name of the international group he had formed in Europe the year before, found many supporters in the United States, including Missouri Senator Harry S. Truman. 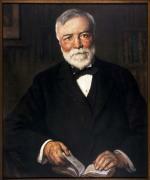 Andrew Carnegie, by F. Luis Mora. 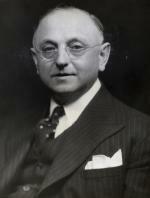 Born in Pennsburg, Pennsylvania, in 1878, Frank Buchman hailed from a family whose ancestors had emigrated from Switzerland to Pennsylvania in the 1700s. After attending a local school run by the Schwenkfelders (one of the German peace churches whose members had immigrated to Pennsylvania in the early 1700s), Buchman attended Muhlenberg College, then graduated from Mount Airy Seminary in Philadelphia. Ordained a Lutheran minister, he started a hospice program in Philadelphia for young men in need. Soon, however, financial troubles and conflict with board members led to his resignation and a crisis of faith. In 1908, Buchman went to England, where he underwent a deep religious experience. Traveling in Europe and Asia, the young minister discovered the common bonds of humanity and determined that in order for us to live as God had intended, each person must first change his own life by becoming morally upright. Buchman believed that in God's eyes an upright life must be based upon four standards: absolute honesty, purity, unselfishness, and love. Having reformed himself through these principles, Buchman spent the rest of his life spreading this gospel throughout the world. His gift for expressing his faith in non-religious language soon won him a growing force of like-minded disciples. Buchman was not alone in his efforts. Indeed, moral pacifism had growing appeal in the early 1900s, especially after the horrors of the First World War increased opposition to war on both sides of the Atlantic Ocean. Before World War I, Pittsburgh Steel magnate Andrew Carnegie had funded the creation of what became the Carnegie Endowment for International Peace (CEIP), which by the 1920s was funding peace conferences and other anti-war activities. After the onset of the Great Depression, more and more Americans came to believe that the United States had been duped into entering the First World War by American corporations lusting for the huge profits of war. Perhaps the most vocal critic of the war "racketeers" was the "Fighting Quaker," Smedley Darlington Butler. Born into a prominent Quaker family in Chester County, Pennsylvania, Butler had joined the Marine Corps, fought in Europe, Asia, and Latin America, and in 1929 become the youngest major general in Marine Corps history. After his retirement in 1931, however, Butler campaigned actively against American military interventions, claiming that the American government waged war primarily to make money for corporations, and that he himself had served as a "gangster for capitalism." In the mid-1930s, Americans were intent on not being drawn into another war, and Congress passed three neutrality acts to prevent it. Anti-war sentiment was so great that after the Japanese in 1938 sank the American gunboat Panay in China, 70 percent of Americans polled thought the United States should pull out of Asia. In the 1920s, the press had begun to call Buchman's adherents the Oxford Group because of his work with university students in England. In Europe and America, pacifism was becoming an increasingly a secular and youth-based movement. In 1936, after undergraduate members of the Oxford Union at Oxford University voted 275 to 153 that "this House will not fight for King and country in any war," a half million American students left their classrooms and staged nationwide protests against the rising tide of militarism. Deeply worried by the rise of Adolf Hitler, Buchman and some of his Oxford Group supporters went to Germany to spread the gospel of moral reform. When the Gestapo labeled the Oxford Group an arm of British intelligence and banned them from Germany, Buchman then spread his message to the Scandinavian countries. In 1938, with the world heading toward war, Buchman's group became known as Moral Re-Armament (MRA). As tensions mounted, Buchman and his associates became increasingly controversial. Insisting that he was soft on Hitler, a growing number of British newspapers and politicians labeled him a threat to England and a bad influence on the country's youth. 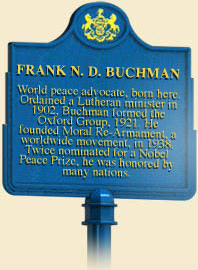 In May 1939, Buchman returned to the United States to spread his campaign for Moral Re-Armament among Americans. His message of unity and moral strength soon won many adherents, including Senator Harry Truman of Missouri, who in a speech to the Senate said, "It is rare in these days to find something that will unite men and nations on a plane above conflict of party, class and political philosophy." Other antiwar groups, including the Fellowship of Reconciliation (FOR), also began to grow in popularity as the prospect of war with Germany loomed ever larger. Buchman addressing the British Industries Fair, 1936. Support for Buchman's message of peace eroded quickly after American entry into the war. Despite nationwide clamor for its modification, the Selective Service Act of 1940 excluded only religious pacifists from military service, so many members of the MRA and other pacifist groups could not file for alternative service. When critics accused Buchman's MRA members of being "draft dodgers," Truman and President Roosevelt at first shielded them from the draft by arguing that Buchman's people were helping the war effort by keeping up the country's morale in the time of crisis. Secretary of the Navy Charles Edison voiced the opinion that "MRA shares equally in importance with material re-armament . . . . Without character and a deep-seated moral re-armament bred in the fibre of our citizens . . . there will be little worth defending." As the need for soldiers increased, however, FDR had to back off in his defense, and a number of Buchman's supporters were drafted. After suffering a stroke in 1942, Buchman returned to Allentown, where he spent the duration of the war, then renewed his international work for peace. When he died in 1961, supporters from around the world came to his funeral in Allentown. After Buchman's death, the MRA went into a period of decline, but eventually reorganized, and, in 2001, changed its name to Initiatives of Change. Buchman's movement for personal reformation was not limited to Christians. His vision also influenced the founders of Alcoholics Anonymous and Up With People. Philip Boobbyer, The Spiritual Vision of Frank Buchman (University Park, PA: Penn State University Press), 2013. Peter Brock, Pacifism in the United States: From the Colonial Era to the First World War (Princeton, NJ: Princeton University Press), 1968. Charles Chatfield, For Peace and Justice: Pacifism in America, 1914-1941 (Knoxville, TN: The University of Tennessee Press), 1971. Gareth Lean, On the Tail of a Comet: The Life of Frank Buchman (Colorado Springs, CO: Helmers and Howard), 1988.